Rutherford Private School & Daycare. Dr. Viktoria Klitovchenko (City Dental), Lufthansa, Baltika, Furnishings2Day, Wellington Jewellers, North York Medical, Fragola Swimwear (FragolaSwimwear.com), Flower Paradise, torontoballons.com, Judy’s Lingerie Boutique, Telehop, Tais Davis. Russian Canadian Info, Gazeta Plus, Radio Plus, Russian InfoPages, Canadian Courier, Russian Carousel, HTB Canada, Ethnic Channels Group, NexTV, Torontovka.com, Beseda, Reporter-Komsomolskaya Pravda, Russian Waves, Russian Proud Canadian, Samovar, Radio Meest. 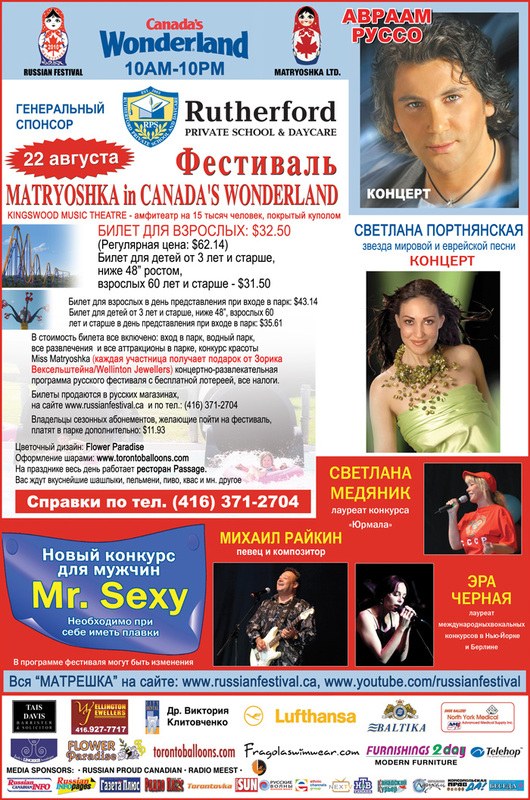 Matryoshka LTD., MBCS, Furnishings2Day, Rutherford Private School & Daycare , Wellington Jewellers, Dr. Viktoria Klitovchenko (City Dental), Fragola Swimwear (FragolaSwimwear.com), Fashion Designer Bruno Ierullo, North York Medical, Baltika, HTB Canada, Torontovka.com, Judy’s Lingerie Boutique, Elvira Berchadskaia, Shoestop, New Market Press, Niki Yampolsky, Passage Restaurant. Rutherford Private School & Daycare, Elvira Berchadskaia, New Market Press, Passage Restaurant. Our deepest thanks go out to the whole staff of Canada's Wonderland for all your amazing work. We look forward to working with you for many years to come! Festival created by Leon Mitsner.